Geografi: En stor gruppe på over 1.000 øer i det centrale og sydlige Stillehav, herunder Fransk Polynesien. Geografisk danner Polynesien en trekantet form, hvor de tre spidser af trekanten er Hawaii, New Zealand og Påskeøen. Polynesien omfatter dele af Fiji, fransk oversøisk territorium, Papua Ny Guinea samt Salomonøerne og Samoa, foruden de chilenske Påskeøerne, Tonga og Tuvalu. Ecosystem Profile Polynesia-Micronesia Biodiversity Hotspot. / : James Atherton et al. Conservation International-Melanesia Center for Biodiversity Conservation, 2007. 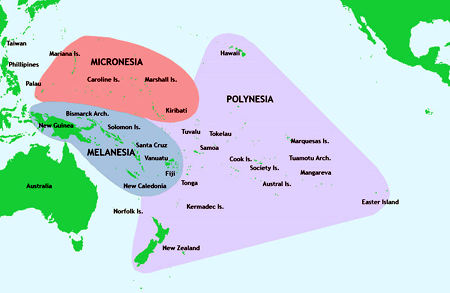 'The Polynesia-Micronesia Hotspot includes all the islands of Micronesia, tropical Polynesia, and Fiji. Included in this enormous expanse of ocean are more than 4,500 islands, representing 11 countries, eight territories and one U.S. state (Hawaii). Despite its large marine coverage, 2.6 times larger than the continental United States, it is one of the smallest hotspots in terms of terrestrial land area, covering only 46,315 square kilometers or about the size of Switzerland. The total population of the hotspot is approximately 3,235,250 but 65 percent of the population is found in Hawaii and Fiji. Not all countries and territories in the hotspot are eligible for CEPF funds; only countries that are World Bank members and signatories to the Convention on Biological Diversity are eligible. Thus six countries and territories in the hotspot, including Nauru; the U.S. state of Hawaii; the U.S. territories of American Samoa and Guam; the Commonwealth of the Northern Mariana Islands, and Tuvalu are ineligible. While this ecosystem profile includes data and analysis from all 20 countries and territories in the hotspot, conservation outcomes and strategic directions only refer to the 14 eligible countries and territories'. Se også: Forsøgsområderne i Stillehavet ; Melanesien ; Mikronesien ; Mururoa ; Oceanien ; tabu. Dixon, Roland Burrage: Oceanic Mythology I-XVI (1916).